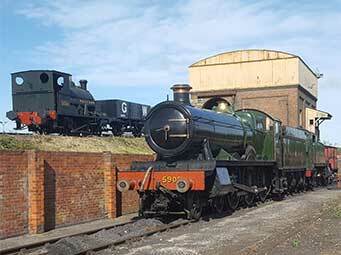 Didcot Railway Centre is based around the original Great Western Railway Engine Shed built in 1932, using loans provided by the government to relieve unemployment, to replace an earlier, less commodious facility. Many features of this original depot survive to this day, together with some later additions. The shed itself is immediately visible once you have entered the Railway Centre. The shed contains four tracks each providing 200 feet (60m) of covered space. Each track can accommodate three tender engines or around six tank engines. The most striking features inside the shed are the smoke hoods running above the tracks and designed to carry all the smoke from the locomotives out through the wooden chimneys on the roof. Note that the hoods above one of the tracks were removed by British Rail before the Great Western Society arrived at Didcot. Operational locomotives not in use on an open day, and those restored for static display can generally be seen in or around the Engine Shed, which you are most welcome to visit. Behind the Engine Shed is the small Lifting Shop containing a 50t hoist, where, for example, locomotive boilers can be lifted from the frames. Due to the nature of the work being undertaken inside, it is generally not possible to enter the lifting shop for safety reasons. Another building which is very evident as you enter the Centre is the Coal Stage. This building was designed to make it as easy as possible to coal and water the locomotives before sending them out for their turns on the railway network. The large tank at the top of the building supplies water through large diameter pipes to the water cranes which can be seen in front of the Engine Shed. Coal is brought into the building via rail wagons which are propelled up the long ramp starting near the entrance to the Centre. Coal can then easily be unloaded into wheeled tubs which can then be tipped directly into the tender or bunker of a locomotive. You can often watch a locomotive being coaled during the course of a running day. The Turntable, situated beyond the Engine Shed, is used to ensure that tender locomotives in particular are facing in the direction of travel. The current Turntable is on the site of the 1932 Great Western one but is a replacement table, as the original had been removed by British Rail before the Great Western Society arrived at Didcot. A locomotive will often be turned on Gala Days and Special Events, and the Turntable is also occasionally used to turn locomotives from visiting excursion trains. The Turntable is adjacent to, and easily viewed from, the Picnic Area. The Locomotive Workshop is not an original Great Western building, but was built by the Great Western Society in 1988. All our major locomotive restoration is undertaken in the Works and the Lifting Shop. Access for visitors to the Works is necessarily restricted by the nature of the heavy engineering work being undertaken within this building, but we will endeavour to provide a viewing area, whenever the centre is open. In addition to the main buildings of the 1932 Engine Shed, there are other original features to look out for as you walk around the centre, such as the sand drying furnace. There are also other features which were necessarily added by the Great Western Railway at a later date, such as the second world war Air Raid Shelter and the remains of the Ash Shed, used to shield the light from hot ashes, being removed from locomotives, from the gaze of passing hostile aircrew. Much more information about the features of the Centre, the collections, and the activities of the Great Western Society, can be found in the Didcot Railway Centre Guide which can be purchased from the Shop or the Ticket Office.